We should have known. Rajon Rondo doesn't like to take a back seat to anyone, including Lebron James. 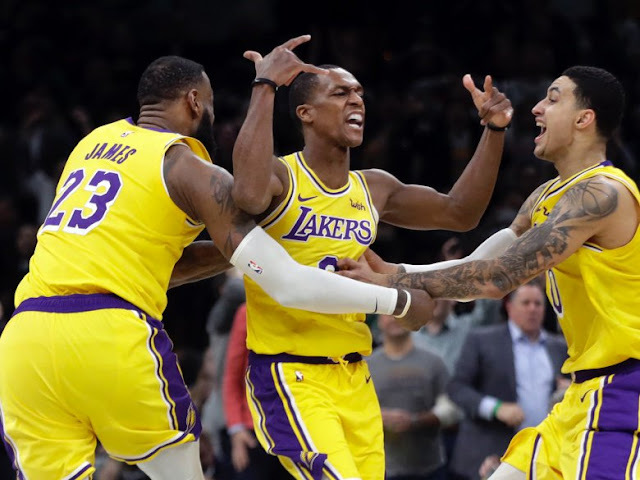 It was James that had the triple-double in the Lakers 129-128 victory over Boston, but it was Rondo that won the game in the closing seconds with his first-ever game-winning shot in the closing 10 seconds of the game. Rondo on the parquet with his son on the morning of the game was a sign. This wasn't just about getting the kid some hoop time - this was about getting the feel for the TD Garden floor once again. I practice those shots all the time,'' said Rondo, who hit his first career go-ahead field goal in the final 10 seconds of fourth quarter or overtime. ''Couldn't imagine it being in the Garden though. ... This is one I'll be playing for the rest of my life'. I have to be honest here. If it had to happen, I am glad it was Rondo that took the game away from Boston. Would you rather it have been The King, someone I hold in extremely high regard as a player - but less and less as a human being? Rondo didn't achieve Lebron's triple-double, but he came close with a 17/7/10 line. If the Celtics had to lose the game, Rondo deserves the accolades. He showed the Boston fans he still has game. But did he have to be so damn comfortable on our own floor?